LIONS Home Restoration & Repair is a full-service home restoration, remodeling and repair company. We have been in business since 2007 and bring a combined 100+ years of experience to each and every job. LIONS is and always has been locally owned and operated and the founders continue to work on-site, ensuring the successful completion of all projects and most importantly, the satisfaction of YOU the customer. 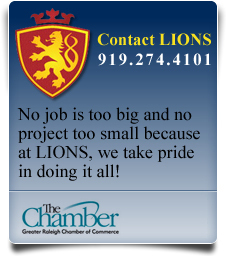 At LIONS, we are on-site for every aspect of each job from start to completion. We are not willing to sacrifice the high quality of our finished product by sub-contracting to the lowest bidder. The same person that provides you with your "no hassle" free estimate will also work on your job from start to finish. We work with a select group of hand-selected sub-contractors that are available to work directly with us if the nature or size of the project demands. This provides you with a single point of contact to provide accurate status updates and ease any change orders if needed, throughout the duration of the project. LIONS is certified by the National Swimming Pool Association and Wake County as a Certified Pool Operator allowing us to manage the maintenance of your Residential or Commercial Pool. All employees of LIONS Home Restoration & Repair are 100% professional on the job site, licensed and certified to do the work. We are fully bonded and insured for your protection. Our skilled craftsmen pay close attention to detail in the quality of work and professional service provided to every customer. At LIONS, we value the opportunity to serve you and it shows.